If ever a song was representative of the turbulent emotions playing out behind-the-scenes of its creation, it’s 1967’s “Reflections,” the first single credited to Diana Ross and The Supremes. Written and produced by Brian Holland, Eddie Holland, and Lamont Dozier, the song’s dark, visceral lyrics of disillusionment speak of “a distorted reality” and “a hurt I can’t control.” Holland-Dozier-Holland knew something about feeling disillusioned; within the year, they’d leave Motown, reportedly feeling unappreciated and underpaid for the incredible string of hits they’d penned for The Supremes and several other groups. 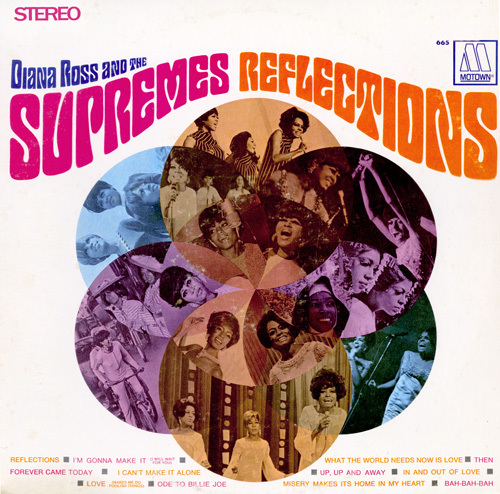 Diana Ross, Mary Wilson, and Florence Ballard obviously knew something about disillusionment, too; “Reflections” was recorded in May, during a period of intense turmoil within the group (dubbed “a major cold war” by Motown founder Berry Gordy, Jr. in his autobiography To Be Loved). By the time the single was released in late July, founding member Ballard was out of The Supremes, replaced by singer Cindy Birdsong. Despite the drama swirling around its creation, “Reflections” became another major success for the group; although it broke a string of four consecutive #1 singles (it topped out at #2, held there by Bobbie Gentry’s “Ode To Billie Joe”), it remains one of the most unique and enduring recordings in the group’s discography. Follow-up single “In And Out Of Love” was also a solid hit; released in October, the bouncy H-D-H composition topped out at #9. But something stunning happened next; according to Gordy in To Be Loved, “By February of ’68, having no new product for the Supremes, we were forced to go back to the can, releasing ‘Forever Came Today’ — cut a year before. That record stopped at a dismal #28″ (262). It was the first Supremes single not to make the Top 20 since “Run, Run, Run” in early 1964. With H-D-H gone from the company, Motown cancelled the planned follow-up single (“What The World Need Now Is Love”) and went in search of a new creative direction to put Diana Ross and The Supremes back on top. The Reflections LP — which collects these final three H0lland-Dozier-Holland singles — is a predictably uneven one, considering it truly encapsulates a group at a crossroads. The only real connecting thread here is Diana Ross; although she sings lead on every song, various vocalists back her up, including Mary Wilson, Florence Ballard, Cindy Birdsong, AND session singers. Several songwriters and producers are also included here; Smokey Robinson, Brenda Holloway, Jimmy Webb, and Dennis Lussier (aka Deke Richards) among them. The quality of these songs varies wildly, and so does the quality of Diana’s vocal work. After years of non-stop recording, television performances, live engagements, and promotional appearances, the singer finally sounds tired here; there’s a weariness to her voice that really hadn’t been audible on earlier records. Although the highlights are strong, there are fewer present here than on most other Supremes albums; much of the material never sounds like anything other than album filler – and not even very good filler, at that. 1. Reflections: “Everyone, the band, the orchestra, the group, the producers, were there, side-by-side-by-side in that little basement studio. It was intense. They knew they were recording something of significance.” That’s the memory of Detroit DJ Scott Regen (published in the booklet to the 2000 box set The Supremes), who was present during the recording of “Reflections” in May of 1967. The work of Holland-Dozier-Holland had steadily been expanding in scope, from the orchestral brilliance of “I Hear A Symphony” in 1965 to the frenetic “You Keep Me Hangin’ On” the following year; the songwriters obviously kept a close ear on popular music, never allowing themselves to fall out of fashion. The musical landscape was dramatically changing mid-1967, with rock sounds and abstract lyrics resonating with young record-buyers; in the box set liner notes, Dozier remembers, “We wanted to answer the new psychedelic sounds.” But “Reflections” did more than just answer psychedelic sounds; it dragged The Supremes back to the dark, shattered territory they’d earlier explored in 1965’s “My World Is Empty Without You” – stripping away the edgy urgency of the previous few singles and forcing the singers to a place of cold, detached bitterness. The song opens with an iconic ten-second wash of sound, beginning with eerie, space-age drip-drops which fade into a smear of metallic noise. This intro instantly signals something new and different, and is followed up by a fabulous Funk Brothers instrumental, dominated by a reptilian percussive rattle and outstanding bassline from James Jamerson that bounces up and down the scale like an out-of-control ping-pong ball. To this track, Holland-Dozier-Holland lend their most cutting lyrics yet; lines like “I’m all alone now/No love to shield me/Trapped in a world that’s/A distorted reality” bypass desperation and travel straight to hopelessness. Diana Ross is the perfect singer to convey such a message, considering she’d blossomed into an expert interpreter of lyrics; she eschews the dramatics of previous singles “Love Is Here And Now You’re Gone” and “The Happening,” instead delivering an icy, detached vocal. Listen to Ross at 1:34, as she sings “All the love that I’ve wasted” — although there’s a strength to her voice as she reaches for the higher notes, she also sounds worn out — as if her energy is literally “wasting” away. This bridge is basically the only chance Mary Wilson and Florence Ballard get to shine on the track; their vocals are really buried in the mix here, almost indeterminate, which is a disappointment after the previous two background-heavy singles. Still, the goal here was obviously to set a spare, hopeless atmosphere, and Holland-Dozier-Holland succeed in spades. According to Dozier, it wasn’t easy to accomplish: “I think it would have been a difficult song to listen to if not for the editing. We were going with a feeling; there were a lot of melodies creeping in and out, and knowing just where to cut it was a bit of a job. It was unorthodox, to say the least,” he commented in the booklet to the box set. Perhaps “Reflections” is a bit unorthodox, but the beauty of this recording is the way it organically evolves the sound of The Supremes; to the edgy simplicity of previous singles, H-D-H added an emotional maturity brilliantly delivered by Diana Ross. The result was a group that remained relevant to record-buyers looking for a little more complexity in their music. 2. I’m Gonna Make It (I Will Wait For You): A dusty, bluesy mid-tempo number that’s notable mainly due to the writing credits. “I’m Gonna Make It (I Will Wait For You)” was co-written by Dennis Lussier and Debbie Dean, names that would probably only be immediately recognizable to die-hard Motown buffs. Dean had been signed to the label as a singer in the early 1960s, notably releasing “Don’t Let Him Shop Around” in 1961 (in the wake of the success of “Shop Around” by The Miracles). Lussier, meanwhile, would find much more success under the name Deke Richards — as both a writer and producer at Motown for some of the label’s top acts. Richards would play a very important role in the career of The Supremes a year later, helping to write the #1 hit “Love Child” — he also later produced Diana’s second solo LP, Everything Is Everything (including the UK #1 hit “I’m Still Waiting”). Here, however, Richards (Lussier) and Dean offer up a solid if not particularly memorable track for the group; there’s a nice soulful feel to the song, and it certainly sounds as timely for the group as the previous track, but it lacks a strong hook. Ross is not as engaging as one might like, and sounds a bit weak during the song’s chorus (her “I Will Wait For You” is a bit tossed off), but her work is certainly competent, and the singer remains compulsively listenable even when she doesn’t seem to be really working for it. Though it’s not a hidden gem for The Supremes, “I’m Gonna Make It (I Will Wait For You)” is a nice listen and good inclusion here. 4. I Can’t Make It Alone: This must be one of the lesser-known H-D-H/Supremes collaborations, considering it never made it onto a single as an a- or b-side; to my knowledge, it’s never been included on any collection aside from this original album. “I Can’t Make It Alone” is clearly another attempt by H-D-H to evolve the sound of The Supremes; the influences of psychedelic and “sunshine” pop are evident here, and the instrumental is quite baroque in nature (and, in fact, sounds a bit predictive of early 70s pop, i.e. The Partridge Family). Although the melody and lyrics aren’t nearly as strong as the best work by H-D-H, it’s a far more compact composition than “Forever Came Today” — it might not be as unique as that song, but it probably would have done just as well if not better had it been released as a single. The recording’s biggest drawback — aside from the fact that it does sounds quite dated today — is Diana’s vocal performance. As noted earlier in this album discussion, there’s a prevailing weariness to the singer’s voice; though Diana is singing from the point-of-view of a woman who’s been left by her love, the weakness in her vocal is more than an artistic choice. There are moments during which she sounds perilously close to losing her voice altogether; just listen to her struggle at 1:54, while singing the lyrics, “I can’t run/I can’t hide…” This lack of polish is surprising given how strong Diana’s voice has sounded on every previous Supremes album; perhaps it’s a result of the ongoing situation between H-D-H and Motown, and the fact that the writers/producers just weren’t working as much anymore. Had there been more care given to the vocal production here, this would have been a much stronger track. 5. In And Out Of Love: A bouncy, guitar-driven pop song that would become the final hit single written and produced by H-D-H for Diana Ross and The Supremes, “In And Out of Love” was released in October of 1967. The song had actually been recorded several months earlier, and had undergone significant changes prior to release; according to writer J. Randy Taraborrelli in Diana Ross: A Biography, “On 12 June Florence recorded another hit with the group, ‘In and Out of Love.’ As it would happen, this would be the last time she would ever step into the studio and record as a Supreme…her efforts in the studio were in vain because, the next day, Motown completely covered her vocals with those of the Andantes” (165). Thus, the resulting song is really the first Diana Ross single, and the audible absence of Ballard and/or Wilson in the background does not go unnoticed. The Andantes, tremendously talented singers, possessed thick, full voices that added depth and polish to many, many Motown recordings. However, there’s a heaviness to their work here that really weighs down the song; Diana’s brassy lead vocal is a bit swamped by the throaty backgrounds. Aside from this, “In And Out Of Love” is a good choice for a single, although the recording lacks the crispness unique to the very best Supremes singles; the sound is a bit muddy, especially when compared to the uncanny tidiness of something like “You Can’t Hurry Love.” The instrumental is a strong one, though; the strumming guitar is a fresh touch for a Supremes single, and the orchestral strings and horns are lovely. Diana’s sprightly performance leads the way; she delivers a memorable vocal, skillfully toeing the line between impassioned and playful. There’s nothing particularly innovative about “In And Out Of Love,” but it remains a solid recording. And be sure to check out the group’s performance of this song on “The Ed Sullivan Show” — Diana, Mary, and Cindy look absolutely fantastic and offer up a nicely done little dance break! 7. What The World Needs Now Is Love: If ever there was proof that Motown had begun losing direction for The Supremes in the wake of the Holland-Dozier-Holland departure, it’s that this song was ever scheduled for release as a single. “What The World Needs Now Is Love” was assigned as Motown single 1125 and backed with “Your Kiss Of Fire” (from 1964’s Where Did Our Love Go) — and was supposed to follow the release of “Forever Came Today.” Thankfully, it was yanked before it ever hit shelves — sparing the world from what would have possibly been the worst Supremes single ever. There’s no denying the greatness of this song, written by Burt Bacharach and Hal David and first made famous by singer Jackie DeShannon; it’s immediately memorable, and nearly impossible not to sing along with. Next to H-D-H, Bacharach and David are unparalleled at creating moving pop songs, and DeShannon’s passionate performance really helped sell the original recording (which was a top 10 hit in 1965). The power and drama of the original recording (and the many, many successful covers of the song) are completely absent on this rendition, which features a snooze of a performance by all three Supremes. Diana, Mary, and presumably Florence (Don’t Forget The Motor City notes the recording for this song as happening back in 1966, when Ballard was still in the group) barely register here; there doesn’t seem to be any feeling behind Diana’s delivery, which can only be described as a somewhat-melodic whisper, and Wilson and Ballard similarly seem to be yawning through this one. The track — apparently produced by Brian Holland and Lamont Dozier — is nowhere near as dynamic as that featured on the original, and comes off like generic elevator music. How something like the superlative “Heaven Must Have Sent You” (later released on 25th Anniversary and the 2000 box set The Supremes) was left in the vaults while this song was nearly issued as a single remains a mystery. Diana Ross would fare much better with this song years later, when she recorded a lovely version for her 1994 holiday album A Very Special Season. 8. Up, Up And Away: This is a better cover than the previous song; also produced by Holland and Dozier, this Jimmy Webb tune first found fame in 1967 thanks to The 5th Dimension, whose recording swept the Grammy Awards that year. The version here is a brassy, upbeat one, driven by wailing horns and some nice harmonies by The Supremes. Diana delivers a strong lead vocal; she’s confident and controlled, and she takes the lyrics literally by “riding” and “gliding” along the melody. The background vocals are a little buried in the mix, but there’s some beautiful work there; to my ears, it sounds like Mary Wilson and Cindy Birdsong on the track, and their voices are a perfect mix of smoky sophistication and jazzy polish. The song itself sounds dated — extremely dated. “Up, Up And Away” is a perfect example of late 1960s Easy Listening, and sounds jarring when listened to some of the darker, more modern songs here (like “Reflections” and “Bah-Bah-Bah”). Still, taken on a technical level, this is a decent recording. 10. Then: Let’s get this straight — “Forever Came Today” was deemed good enough to release as a single, and “What The World Needs Now” was deemed almost good enough — and yet “Then” was left as mere album filler? This is a fabulous Smokey Robinson tune; to my ears, it sounds like a lost hit for the group, a song that easily could have climbed to the Billboard top 10. Robinson, of course, had a long history with the group, having helped facilitate their initial Motown audition before writing and producing a few of their earliest singles. Finally back in the producer’s chair, Robinson delivers one of his patented sugary confections, boasting typically clever lyrics and an exciting, driving instrumental. Diana, Mary, and Cindy are in glorious form here; Ross sparkles on the lead vocal, and her groupmates offer up tight harmonies. Here again is a chance to relish the sound of these “new” Supremes; although they’d never quite regain the vocal interplay evident on earlier group recordings, there’s a joy and lightness to the singing here that’s refreshing (Cindy’s lilting voice is particularly audible at 1:19, on the line “Up is down…”). Wilson and Birdsong are in perfect accord on the backgrounds here, their voices ringing like bells behind the Diana’s relaxed, soulful performance. More than just the strength of the writing and the performances, Robinson captures a real magic here; again, it’s hard to believe Motown didn’t jump on this song and rush it to radio. Interestingly, Diana Ross and The Supremes would record “Then” again; it’s included on 1968’s Diana Ross & The Supremes Join The Temptations as a collaboration with Motown’s top male vocal group. It’s a good version, but this one is the standout; “Then” is a great hidden gem of the 1960s Supremes discography. 11. Misery Makes Its Home In My Heart: This is another Smokey Robinson song; according to DFTMC, the recording was completed back in the summer of 1966, which explains why the prominent background vocals sound like those of Mary Wilson and Florence Ballard. This is a jumpy tune with a syncopated, calypso-ish beat; it’s much more “classic Motown” than the rest of this album, and actually would have been a better fit on the group’s upbeat 1966 LP The Supremes A’ Go-Go. “Misery Makes Its Home In My Heart” is nowhere near Smokey’s best; the lyrics aren’t quite as concise as it typical for the writer (i.e. “The door to my heart was open/Open wide, much wider than wide”) and it’s not as melodic as classics like “My Guy” or “My Girl.” Still, there’s something delightful about this recording — coming after the darker, more modern tracks that led off Reflections, this song serves as a nod to the finger-popping, carefree Supremes of yesterday. All three ladies mint fine performances; Ross lends the lyrics an edgy urgency, and Wilson and Ballard are in full-bodied voice behind her. I still say “Then” is the Smokey song that could have been the big single from this album, but “Misery” would have made a killer b-side. 12. Ode To Billie Joe: This is an interesting way to close Reflections; “Ode To Billie Joe” is the huge hit song that kept “Reflections” from hitting #1 on the Billboard Hot 100. Released by Bobbie Gentry in summer of 1967, the song topped the charts for a month (while “Reflections” settled for the #2 spot), and garnered several Grammy Awards that year. Gentry’s composition is classic Southern Gothic, a winding tale of a boy named Billie Joe McAllister who jumps off a bridge. The original arrangement was hauntingly minimal, with Gentry mainly accompanied by acoustic guitar and swelling strings. The version here is nearly identical; producers Brian Holland and Lamont Dozier don’t change much, aside from possibly adding in a few more instruments. Diana Ross does a good job with the song; it’s well within her range, and she’s convincing in her delivery of the folksy lyrics. There’s nothing particular notable about this cover, but it’s not a bad inclusion. In his AllMusic review of Reflections, writer John Lowe comments, “It was apparent that both parties [H-D-H and The Supremes] were battling creative fatigue and were exhibiting the appropriate scars at the time.” Lowe’s right, and “fatigue” is a good word for much of this album. Reflections isn’t bad (there would be weaker Diana Ross and The Supremes albums to come), but it’s lacking the energy and glossy sheen present on the group’s previous LPs. Accordingly, the album wasn’t as strong a seller as most of the group’s earlier offerings; when released in March of 1968, it stopped at #18 on the Billboard 200, an especially unimpressive peak given The Supremes had scored #1 albums in each of the previous two years. Amazingly, Reflections was only the first of an astounding six (!) albums released by the group in 1968; the group was about to embark on its busiest year yet…with varying results. This entry was posted in Studio Album and tagged Cindy Birdsong, Diana Ross, Diana Ross and The Supremes, Florence Ballard, Holland-Dozier-Holland, Mary Wilson, Motown, Reflections (1968), The Supremes. Bookmark the permalink. I need to dig out the CD for this album that I bought years ago. I listened to it once and then never again – it seemed like such a hodgepodge of songs and not very cohesive or memorable for the most part. Yet, I LOVE the title track – and “In and Out of Love” is very catchy. I just played “Then” on Youtube – I agree it’s a strong song but not sure it would have been a hit single. “Forever Came Today” isn’t bad – but it reminds me of a B-side. Wish HDH and Berry Gordy had stayed on good terms – and that they had done some of Diana’s solo material! It’s funny, the more I listen to “Then” the more I really like it — I think there’s really something seductive in the production and the delivery of the lyrics and it’s becoming one of my favorite Supremes “hidden gems.” Meanwhile…I just can’t understand “Forever Came Today.” I’ve tried and tried over the years, and especially when preparing for this article…but the song just sounds like a mess to me. I’d love to really ask HDH what they were going for on that one. Reflections has always been a favorite of mine and as such I had hoped the album would live up to the single, obviously , thats’s not the case here, although I do like it, but only half of it. Forever Came Today, has always sounded like a demo to me. not the typical polished Supremes singles of the day.although I do like elements of the song and the lyrics. something was always missing . I am still surprised Motown released it. What The World Needs Now, . It sounds like the Supremes went in to” MARK” the song and that’s the version that got released, ….the run through. sorry ,for the first time I have to disagree on Up Up and Away, I cant listen to it.it seems so laid back,….lackluster, but once again you make me want to go and have a listen. so I will. Bah Bah Bah is a favorite. I would have replaced FCT with The Happening but ,by the time this album was released, the single was a year old. I 100% agree that “What The World Needs Now” sounds totally unfinished, and like Ross and the ladies were laying down rough vocals that should have been re-done later. There are MUCH better outtakes that could have really elevated this album, especially “Heaven Must Hav Sent You” — which sounds like a big hit to me. btw, at the time of the release of the title single , it was originally going to be the last Supremes single and Diana would go solo shortly there after. of course she stayed until her contract was up. after a listen last night, I have to agree that THEN is a standout track….not sure I would have issued it as a single but if I had the choice of Then or FCT, I would have went with Then. on a second listen to Up and Away, it is better than I thought. but the original is such a classic it took me a while to get past it. I still feel like I want more from it as far as production but the vocals are good. also, on The Motown singles collection there is a version of What The World Needs Now that seems to be a bit better. the backing vocals seem louder to me. Wow — I’ll have to track down this alternate mix of “What The World Needs…” and see how I feel about it then. On this album, it is just so badly done. How could Motown have decided it was good enough to be placed on the album?? can be heard strongly in the background adding a rich full sound. Well, your hearing is better than mine — to me, only the heavy voices of The Andantes are audible — I just don’t hear Florence here, nor Mary. This song fares better on LIVE AT LONDON’S TALK OF THE TOWN, with Mary and Cindy backing up Diana and adding just the right amount of lightness to the vocals. Berry Gordy found Florence’s vocal too rough sounding due to her recent heavy drinking. He then blended their vocals with the Andantes.Florence’s rich soprano can be heard stongly in the background adding much to the sound. It took some time, but finally I felt I had to comment on „Forever came today“. To me, it does not sound unfinished, it is a bit edgy though. Therefore I very much like a kind of smother extended version which can be found on YouTube- a lot of strings is used around the song. By the way, I love the flawless live performance on Ed Sullivan! I think it’s not an easy song to sing. I rediscovered this site recently, only to find you had extended it to include Supremes albums! I’ve been tearing through each entry and absolutely loving it. Amazing job! I had to chime in here because I’ve agreed with nearly every song assessed. I totally agree that it shouldn’t have been a single- it’s just a bit too far of a jump off the deep end for mass consumption. It’s one of HDH’s most challenging compositions, and one of their least accessible. But I’ve never heard it and thought “this is a mess”. The structure of the song is a bit unusual but it’s not THAT crazy- the only odd part to me is that the second verse almost serves as a sort of bridge which, instead of leading to the chorus, leads to another verse. Could a major issue with FTC be that, for the most part, none of the lyrics rhyme? I think HDH’s source of pride may simply that they created something truly unique. It’s still one of my favorite HDH songs and one of my favorite Supremes songs. But I totally get why it’s not everyone’s cup of tea. However, I TOTALLY agree with your assessment of Then. When I first heard it years ago I thought the same thing- it’s a such a beguiling, clever song. And Mary and Cindy sound so good countering Diana on that chorus. And what a chorus! The 1995 Anthology has a cut of Then that is like 20 seconds longer than the Reflections version, where Diana just keeps screaming “THEEEEEEN I DON’T LOVE YOU!!!”. I’ll have to upload it onto youtube one of these days. But yes, great song. Hey Marcus — long time! Glad you found all these Supremes reviews. It took a long time, but I’m so glad I finally started delving into the 60s material — it’s been fascinating for me, and I have a whole new appreciate for what Diana/The Supremes accomplished during the decade. LOL — I’ve caught a lot of hell for “Forever Came Today” — there is just something about the recording that doesn’t “gel” for me. I appreciate HDH pushing their sound and creative abilities, but for me, “Forever Came Today” just never comes together in a satisfying way. You’re absolutely right — the lyrics are odd in that there’s no real rhyme scheme, and the structure is extremely strange. But more than that, I don’t love Diana’s vocal, nor am I a fan of the backgrounds. The Andantes elevated so many Motown recordings, but this is a song that it already so dense that the addition of their voices is just too much. And much of Diana’s lead vocal performance sounds weak to me — I want to hear her sounding fuller, and more inspired. I really wish “Then” had been given a chance as a single. All three Supremes sound so good. I don’t have the ’95 version of the Anthology — I gotta find this!! Paul, what did you think of the new version of What The World Needs Now from the new A GO GO expanded edition. not sure if you have done a review of the new collection but I like this version much better. this is most definitely one of the first “patchwork” albums by the supremes. there was the potential to do something a bit more meaningful and cohesive – they have enough canned tracks to do so. While I’m not a fan of In and Out of Love, I do at least recognize it as the Supremes meet Sunshine Pop – a phrase used to describe much of the California/folk sounds of the era like the Momma’s and the Poppa’s, Beach Boys and Fifth Dimension. That combined with the psychedelic sounds of the title track and some of the others, makes for a “California” album by the supremes. Still I think some alternate tracks would have helped fortify this approach. Lamont Dozier told me at a party that Forever Came Today was the biggest surprise of his career, he expected it to hit number 1. He said he never could understand how, or why it fell short. I thought it was the most soulful song on the album and my personal favorite. Reflections was magnificent, but was not as driven by Diana’s lead vocal as Forever Came Today. The album was released by another name in Asia. The deleted Reflections album cover with Florence is on this sleeve. Check the top right photo–not the album cover that was released and that’s definitely Flo above Mary and Diane. I could understand Motown preparing alternate covers with Flo and Cindy given the timing of the album’s release and Cindy replacing Flo, but BOTH on the same cover? Did they think that no one would notice?